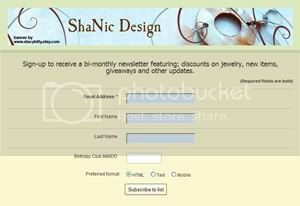 ShaNic Design-Handmade Jewelry: What was I thinking? So, I have been trying out new techniques in, regards to my jewelry making. Metal work is something that has been interesting me more and more. I know I should have used less expensive wire, before venturing into this, but I did not. I purchased some half round sterling silver wire and I don't like it. I love however, 16g round wire which I made these beautiful earrings from. These were sold the first day I opened my Etsy shop. I also love 20g round wire. I was thinking about putting it up for sale in my destash category, but the price of silver is down, so I won't get a return on it. Well, I guess I will have to find some use for it. I feel your pain, perhaps you can google a place that takes old metal and melts it down in exchange for cash? Those are beautiful earrings, love them!